See trends in mesenchymal stem cell research from more than 300 trials with a simple, online tool. With hundreds of clinical trials in various stages of evaluation, MSCs are one of the most commonly used stem cells in current clinical applications. 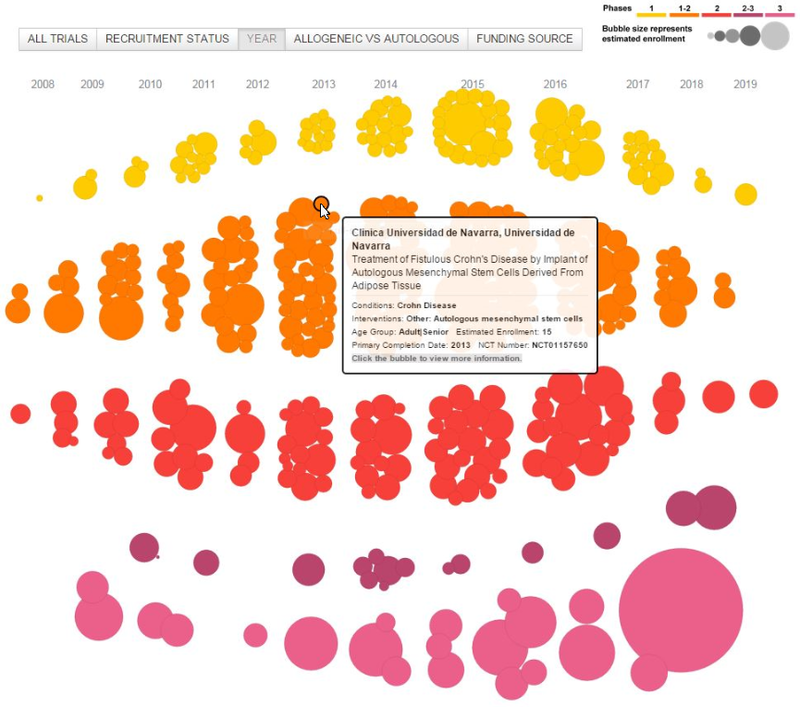 Get a bird’s-eye view of research involving MSCs with the Clinical Trial Visualization Tool, an interactive data visualization that has pulled together data from clinicaltrials.gov on over 300 trials involving MSCs. Caption: MSC clinical trials, represented by circles, are categorized by year in the Clinical Trial Visualization Tool. Circle size represents the estimated enrollment and circle color represents the phase of the correlating trial at the time the data was last pulled from clinicaltrials.gov. The Clinical Trial Visualization Tool allows you to quickly sort hundreds of MSC clinical trials and readily view key data points of each trial. Terumo BCT is a global leader in blood component, therapeutic apheresis and cellular technologies.